Pictured above (L to R): Joseph Brown, Leah Hyatt, Chloe Dill, Hannah Nave, Megan Braswell, Jennie Williams, and Cortney Melton; who represented Cannon County in the Sub-Regional 4-H Public Speaking Contest held recently at Murfreesboro. These 4-Hers placed 1st and 2nd in their classroom and county public speaking contest to earn their berth in the Sub-Regional Contest. 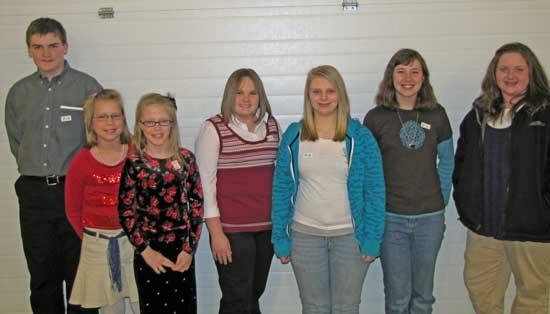 These 4-Hers competed against other winning 4-Hers from 12 counties from Middle Tennessee. Thanks and Congratulations to all these 4-Hers on a job well done! Snow Days - Due to the recent snow and ice, there has been much re-scheduling of the 4-H club schedule. Please pay close attention to school announcements regarding the re-scheduling of your 4-H club. 4-H Chick Chain - This month we are beginning one of the most popular animal projects: the 4-H Chick Chain. During the month of February, we will be handing out fliers on the project. For those who are not familiar, the 4-H chick chain is where your 4-Her can sign up and receives 25 baby chicks. After caring and raising for the chicks during the spring and summer months, the 4-H chick chain show and sale will be held, all participants will be asked to bring their six best hens back for the show and sale where they will be judged and auctioned off. The proceeds from the auction will be used to purchase the chicks for following years. If your 4-Her is interested, please return the bottom of the flier to the 4-H office at 614 Lehman Street along with the $25.00 fee for participation by the March 8th deadline. Participation is limited to 25 4-Hers, so if you are interested, please sign up quickly. 4-H Horse Shows - With all the snow and freezing temperatures we have seen lately, it may seem hard to believe, but spring must be around the corner. If you are interested in exhibiting your horse in the 4-H Regional and State 4-H horse shows, the enrollment deadline is rapidly approaching. A Horse Enrollment form must be completed for all horses that may exhibit in the Regional and State 4-H Horse Shows, you can find the form on the following website: http://animalscience.ag.utk.edu/Horse/4-HHorseProject.html , or stop by the 4-H office and pick one up. All enrollment forms must be turned in to the 4-H office by the March 1st deadline. 4-H Camp- As our thoughts turn to warmer weather we find ourselves thinking and looking forward to those warm, busy, activities of summer. Here at the 4-H office, we are planning a very successful camping season. This year we have two camping opportunities for all of our 4-Hers in the 4th through 8th grades. Junior High Camp (grades 7 & 8)- Will be held June 1st – 4th at the Clyde York 4-H Center. The cost for the week is $231 and includes all meals, lodging, and activities. Junior 4-H Camp (grades 4th – 6th)- Will be held June 21st -26th at the Clyde York 4-H Center. The cost for the week will be $225 and will include all meals, lodging, activities, and transportation. 4-H Camping is a great way for your 4-Her to develop leadership skills, make new friends, and experience the great outdoors. While at 4-H camp your 4-Her will be able to take full advantage of canoeing, rifle range, fishing, baseball, football, put-put golf, swimming, ga-ga, water and land Olympics, ropes course with zip-line, crafthouse, and many many others. For more information about the Clyde York 4-H center, visit the Clyde York 4-H Center at: www.clydeyork4hcenter.org. For more information about any of the programs, activities, and events offered by UT Extension, please call the 4-H office at 563-2554.